The kids are back in school. Metro traffic is morphing into a new flavor of agony. The election America never wanted is reaching fever pitch. The new health insurance rates and gouging for 2017? I can’t even go there right now. Only one thing can save me from this: a cold blizzardy day with the snow piling up like laundry in the hamper in my daughter’s room. For most of my friends autumn is the seasonal equivalent of Sunday. It’s a day for luxuriously wasting time —while slowly building a walloping Monday Morning Dread as the sun begins its earlier nap and the reality of parenting, working, hand-wringing and commuting sinks in. So when freaks like me get all chirpy around Labor Day and start clamoring for an early winter, well, let’s just say my social calendar opens right up. But if you’re one of us, one of the deviant cult of Ullr, you know what I’m talking about. For those who live the Type A life because “A” is for “Awesome” — and “All.” “I want it all. 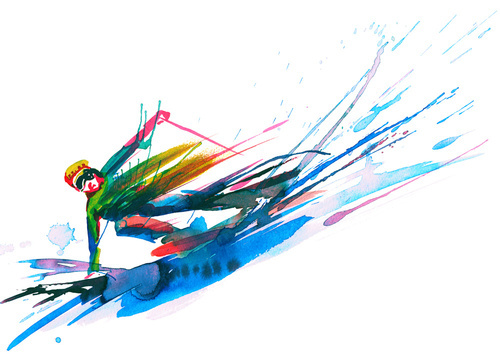 Now.” — skiing is the rocket fuel that propels us from week to week, crisis to crisis. It’s the perfect cure for people who either stay wrapped up too tight or attempt wildly unrealistic lives, often saying that, “we can sleep when we’re dead.” Skiing in Colorado is insanely extreme, absolutely fraught with danger, and it’s mildly pleasant, pedestrian and as relaxing as rowing a boat on a warm, serene pond. For the full therapeutic effect, I prefer more of the former and usually promise more of the latter to my wife and daughter to get them to buy into this whole scheme. Sniff all you want, if you don’t spend most of your time close to home at Loveland Basin, Arapahoe Basin or Winter Park and Mary Jane, you just think you’re skiing. I’ll ski anything. Groomed piste, trees on cliffs, cornflakes in the parking lot, I don’t care. But what I like most, what I crave, are those very, very high places with snow unlike anything anywhere else on Earth. Frigid wind at almost 14,000 feet creates a silky yet sturdy surface over steep, craggy rocks unlike any other. The view, the cold, the sky, the sound of the ceaseless wind competing with my wheezing gasps for air is like mainlining bags of endorphins. The thing about skiing is that no matter how angry you are at your wife, your boss, your lazy brother-in-law, no matter how much work is piling up while you’re away, no matter how awful it’s going to be dragging yourself on your stomach through your crawlspace to stick your hand in a spider-filled hole to turn the leaky water valve off, none of that exists when you’re skiing, and especially when you’re skiing extreme. Skiing is truly the perfect Zen experience. It’s not only wildly exhilarating to know — not just in the back of your mind but in every crackling and sizzling nook and synapse — that you have no damned business being atop a 13,500-foot peak in a snow storm, fighting snow-vertigo, jamming to Cubano samba and wondering if your hands hurt from clenching them or because the frostbite is getting serious. A good skier is able to focus like a surgeon on every aspect of the descent: velocity, incline, snow texture and moisture content, depth, obstacles, friction, debris, wind resistance, pitch, roll, yaw and snot flow. And every one of those aspects can and do change several times each second, thousands of times each minute. Skiing is the art of constant and instant recovery. A better skier not only does all that, but constantly calculates which way to go to 1. maximize the thrill and pleasure; 2. minimize the need to depend on your expert but always overrated ability to recover; 3. avoid catastrophic injury and death. In many ways, it’s like trying to ride a rocket in a giant-hail storm while steering with two fence pickets. Trees? They’re simply eye candy thrown in for dessert as a reward for making it back down that far on the mountain. It’s more than fun. It’s therapeutic and addicting in a way that only those hailing to Ullr will know, and those who don’t have sense enough to see a real doctor. Those are the ones who annoyingly sniff at what is arguably the most wonderful time of year in Colorado. And off to study the season’s climate forecasts, marvel at the first dusting on Colorado’s hungry peaks, and maybe daydream, I’m outta here.